Many people are first introduced to shooting by using either an air pistol or air rifle, most likely a Webley or BSA. These air pistols and air rifles are collected today, in particular those in their original boxes. 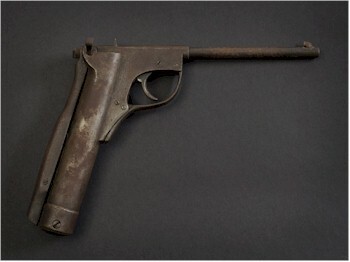 A rare .177 calibre lever-cocking air pistol, Lincoln Jefferies Type B model number 43. It might seem that something that was played with in the family garden many years ago would not be of value today, but in fact a mint and boxed Webley Junior .22 air pistol will easily fetch £200 at auction. Early derivatives of air pistols from various manufacturers are also sought after by collectors and pristine examples of these air pistols will command £150-£250 at auction. Webley also produced a series of sporting air rifles that have been popular over the years. Perhaps the most sought after is the Webley Service Air Rifle, with its interchangeable barrels. A good example of the Air Service air rifle can fetch upwards of £400 at auction with cased examples fetching even higher. Air cane guns were produced at the turn of the century and have become extremely collectable in the current market. The heavy casing can be either of plain design or naturalistically modelled to look like a wooden walking stick. In both cases, examples in good condition regularly fetch £400-£600 at auction. Cased examples of air cane guns, complete with stirrup pump and accessories, can reach £1,000-£1,500 in the specialist sporting and collector's sale.